Pete Seeger, dead at 94: “We Shall Overcome” singer embodied the spirit of folk more than anyone. Even when his country tried to stifle him, he always overcame. The legendary American musicologist Charles Seeger once remarked that “the folk song is, by definition, and, as far we can tell, by reality, entirely a product of plagiarism.” This wasn’t a knock, of course—Charles Seeger loved folk music. He meant that to be a folk musician, a great folk musician, was to be endlessly open to influence, to hold the conviction that all music was everyone’s for the having and hearing and sharing, provided it was afforded the love and respect it deserved. No folk musician more completely embodied this than Charles Seeger’s son Pete Seeger, who died Monday at 94. It’s difficult to imagine 20th-century music without Pete Seeger, but it would certainly sound much different, and much worse. Seeger was born in New York City in 1919 and grew up surrounded by musical and intellectual royalty. Aside from his father there was his stepmother, Ruth Crawford Seeger, a renowned modernist composer and the first woman to be awarded a Guggenheim Fellowship in music, in 1930. His half-brother, Mike, would become a major folk musician in his own right. His late uncle Alan, killed three years before Pete’s birth, penned one of the most famous poems of the First World War. This is an extraordinary and brilliant statement, one that turns the inherent democracy and availability of folk music into a clarion call of moral righteousness. Seeger would ultimately be indicted and convicted for contempt of Congress, though his conviction was overturned in 1962. Of the many great things one can say about Pete Seeger, this might be the best: When the country he loved did its best to destroy him, he loved it too much to let it. By the early 1960s America was in the midst of yet another folk revival, and Seeger became a sort of éminence grise. He took a new generation under his wing, and that generation would change American music and to no small degree America itself. Songs like “We Shall Overcome,” “If I Had a Hammer,” and “Where Have All the Flowers Gone”—all of which can be traced to Seeger—became touchstones of the civil rights and anti-war movements. In 1965 California folk-rockers the Byrds hit No. 1 with “Turn! Turn! Turn!,” a composition of Seeger’s that featured lyrics from the book of Ecclesiastes. That same year Pete Seeger became the most famous axeman in the history of rock music. I mean that literally: Rumors circulated that he’d threatened to take an axe to Bob Dylan’s guitar cables when the lapsed wunderkind plugged in his Stratocaster at the Newport Folk Festival. This story is probably apocryphal, although it’s been confirmed that there was indeed an axe backstage, and Seeger was certainly awfully pissed. The axe-wielding fantasy has endured because it’s funny and a good story, but it also makes Seeger seem like a moldy fig, the haggard dad screaming, “Turn it down!”—while in reality he was anything but. Seeger was a figure of enormous generosity, endlessly curious about music and people, always open and always self-effacing. Even when he ascended to the “national treasure” status that softened the memories of his radicalism, he always seemed both warmly approachable and totally plugged-in (figuratively, of course). A week before his 90th birthday Seeger performed at Barack Obama’s first inauguration, a deeply moving spectacle for anyone who saw it, particularly those with a knowledge of his role in the civil rights movement and the shoddy treatment he’d once received by the government that was now calling him for a photo op. A bitter man might have refused, but Seeger was never bitter, always just bigger. The question of what songs Pete Seeger actually “wrote” is a complicated one that also misses the point. He wrote none of them and he wrote all of them. Pete Seeger did not invent “We Shall Overcome,” but he made it his and made it everyone else’s. He never claimed he invented it, and he never diminished the people who had, even if their names were by that point mostly lost to history. 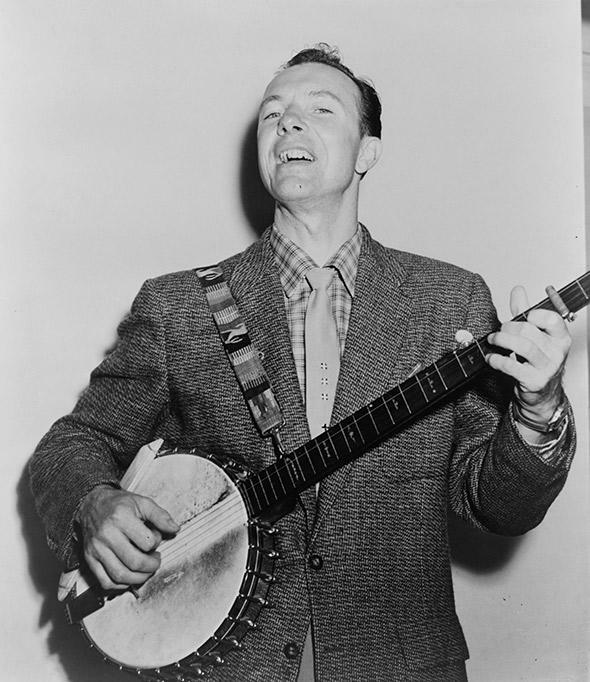 Pete Seeger borrowed music while honoring it and honored it by borrowing it. In America that is pretty close to a miracle. I never met Pete Seeger, and I can’t claim that his albums ever sat at the front of my record collection. But I can’t remember a time in my life when I did not know who Pete Seeger was. 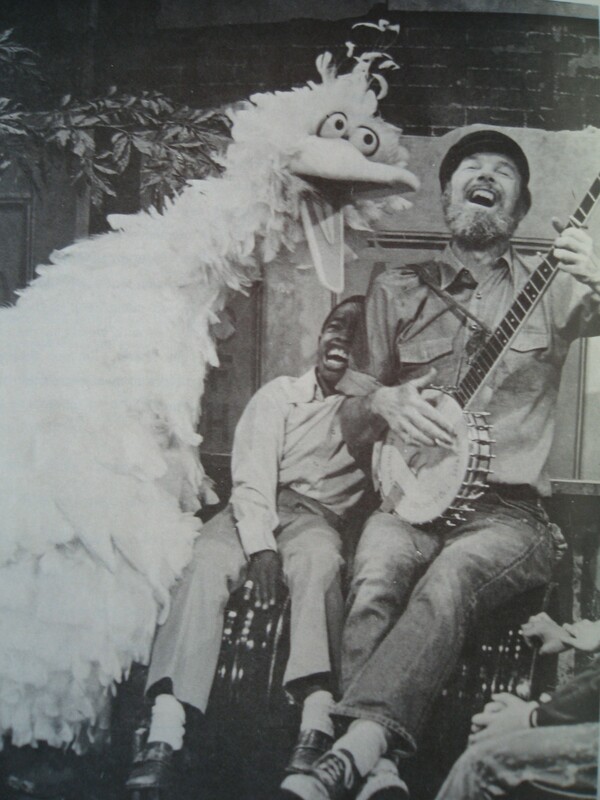 We sang his songs in elementary school, we sang his songs at camp and at church, I saw him on public television so much that I figured he just lived on Sesame Street, which he sometimes did. Pete Seeger was everywhere and everyone’s. He was in your ears and your voice and your bones without your even knowing how he got there. He was folk music.